Scott: Conversion optimization is both an art and science. It offers methods for making strategic variable changes to a Web page in order to improve its performance and ultimately boost your bottom line. To identify conversion factors you must first understand what goals you have for any given Web page and how visitors are expected to accomplish those goals. Ultimately, you want every page on your site to funnel visitors toward conversion goals. A conversion can be any action that moves a visitor further down the conversion funnel, whether it’s a phone call, filling out a form or even just a microconversion click-through. Using various methods of scientific testing, conversion optimization helps you realize improvements that can be made to increase the performance of your website. What does testing consist of in conversion optimization? Many site owners shy away from conversion testing because of the potential negative impact it could have. Since conversion testing is just that: testing – there is intrinsic value even if the testing produces fewer conversions on a Web page than it did prior. This way, you know what not to do. It’s important to keep in mind, though, that educated testing seldom produces negative results, and even in the instance that negative results occur, you are not bound by those results. Typically a test can run anywhere from a few weeks to a month, so we’re talking a very short-term period that likely won’t have a lasting negative impact on a business. Also, the benefits of knowing what you should not do to your site based on negative test results can easily justify the value of having to run that test. As a benchmark, both Google and Amazon have reported that roughly 50 percent of all the tests they engage in report negative results, yet both companies continue to test vigorously. One example of a site that saw huge monetary gain before launching a scientific test is Overstock.com. Bryan Eisenberg suggested that they change their shipping proposition to “free”. Since high shipping costs are the leading factor in shopping cart abandonment, this one change wound up being worth several million dollars to Overstock’s bottom line. How does conversion optimization relate to SEO? Conversion optimization and SEO go hand in hand. They are essentially two halves of the same pie. SEO drives traffic to your site, and conversion optimization makes your site perform better for that traffic by increasing sales, leads, click-throughs or other goals that you may have. Why is conversion optimization important right now? Your customers are leaving you. According to a Forrester Research report in 2009, the average conversion rate for a website was 3 percent. That means on average, 97 percent of people who visit a site, bounce without making a conversion. You’re losing money. By retesting the same Web page over and over in iterations, you can continuously improve that page’s performance and claim more of the money that you essentially lose every time a visitor bounces. Each time you make an improvement to one of your pages, that improvement continues to perform even after the test is complete. Your competitors are already testing. A few years ago, nobody really knew that Internet conversion testing was something that people did. These days, that’s changing, and conversion optimization is growing. Top competitors in just about any niche imaginable are likely participating in some form of conversion testing. For instance, companies like Google and Amazon have several hundred tests running on their live sites at any given time. Chances are, you have already been a participant in one of these tests without knowing it. Where do you see conversion optimization headed? My predictions are that within the next two years, conversion optimization will be at least on an even playing field with SEO, as far as popularity and global reach are concerned. I’m amazed at how many new faces are involved in conversion optimization every day. It’s looking a lot like SEO did in the late 1990s. Of course, the methods and approaches that we currently use for conversion optimization and testing will continue to evolve over time, and they may eventually be different than what we use today. This is because conversion optimization is all about good ideas. Everyone has good ideas from time to time, which tells me that we will continue to see new faces and new ideas that change the way that we do business on the net. What are the crucial concepts within conversion optimization? I think Bryan Eisenberg puts it best: always be testing! A boardroom full of executives or marketing personnel could sit around for weeks thinking up great new designs, product placements, navigation, headlines, images and so on; but in the end, all they will have is educated guesswork at best. In fact, many times the marketing executives are so out of touch with their actual customers that calling it “educated guesswork” isn’t even valid. Only through scientific processes and testing, can we truly validate those ideas and know for sure whether or not they are effective. To me, that is the most crucial concept behind conversion optimization. In general, what are some basics that can be applied to increase conversions? Well, the two major parts of conversion optimization are actually the hardest to determine. Those are: 1) Who is your audience? and 2) What are your goals for that audience? There are many resources that can help you to understand the demographics of your site, such as Compete.com. Analytics tools and persona development strategies can help to identify the psychographics of your site’s audience. Understanding demographics and psychographics together will help you to target your actual customers, rather than the visitors you think are customers. You need to always keep your goals and audience in mind, even when designing elements like your “add to cart” button or hero banner call-to-action. Even without testing, changes that are oriented around your audience will typically show some improvements. And through testing, you can increase the success of those improvements. What can a person do to get started with conversion optimization? I’m a big fan of Google’s Website Optimizer software. It’s free, and quick and easy to install on just about any site. Google’s platform allows you to run all types of split and multivariate tests. Those are the most basic and common forms of conversion testing on the Web. Of course, there are also several companies that specialize in conversion optimization and can help you initiate the tests properly, and also offer up some proprietary alternative methods for testing. What if someone is having trouble with executive buy-in for conversion optimization? This is a great question that comes up a lot, mostly in smaller businesses. In small businesses, the president of the company typically plays a big role in the overall design of the site. This gives the person in charge sort of a “parent” complex, where he or she views the site as his or her child, and directives are often subjective. This is in contrast to what the website should actually be treated as: a salesperson. The best way to counterbalance the parent mentality is through the use of hard evidence and facts. One approach that usually yields results is the “it’s only testing” approach. This shows your boss that the changes you’re proposing are only temporary, unless they should outperform what already exists. Be prepared when you meet with your boss. Go in armed to the teeth with case studies and examples of real-world results. These days, a single Google search can dig up countless case studies to support your cause for conversion optimization. Where can people learn more about conversion optimization? There are so many great sites that provide info to people who are interested in conversion optimization. Two of my favorites are Seth Godin’s blog and Bryan Eisenberg’s blog. Anne Holland’s Which Test Won site is also a great critical-thinking resource. A good way to look at it is like this; if you drive traffic to your site but your site does not perform then you will not get a good ROI. If your site performs but you have no traffic then you will also not get a good ROI. In summary yes, you need a well rounded marketing strategy to maximize your ROI. Otherwise you are always leaving money on the table. I think what you basically said is that if you are going to make an investment in great SEO, then you had better make the corresponding investment in conversion optimization as well. One without the other is a poor business plan? Great points. Shooting for conversion rates in the 20 percentile is a great goal. Unless you are Schwan’s which was listed @ 45.8% conversion rate in January by Niesen. But I would consider them to be more the exception than the rule. ;) Clearly we can all learn a lot from that site. Thanks for the feedback, I’d like to check out your new tool! Thanks for your insight, Dennis. Appreciate you taking the time to contribute! I think you got it right in this article. Then new trend in SEO is conversion rate optimizing (CRO). Client understand that filling the funnel is important (SEO) now they got a nice funnel (lots of traffic) it monetizing the traffic that the win. Its nice to place a name on it CRO since its easier to explain. It will on the other hand demand different skills of SEO’s to get it right. But I guess tools like ours http://www.reedge.com will really help there. Thanks for the feedback and reply! There is no free report for this available online, however you can buy the research report directly from Forrester that contains this data and much more: http://www.forrester.com/rb/Research/trends_2009_us_online_retail/q/id/47611/t/2. Keep in mind that this report specifically measured sites that received more than 500k unique visits per month. Great article – and really achieving conversions is the holy grail at the end of a great SEO campaign. That said something in the article really stuck out and I was hoping you could help me locate the source. I get asked the question “what is a conversion rate to shoot for?” on a regular basis. Obviously this is dependent on the vertical but, having read this article in the past, I always give 3% as a ‘goal’ metric. I’ve been searching high and low to find an actual link to the article. Any chance you could point me in the right direction? Good one: visitors don’t ever fail to convert, it’s your site that often fails to convert visitors. Thanks for the comment Atle, glad we can help! The idea behind SEO is to drive targeted traffic to your site, not just any traffic. That in mind, if you have a site with fairy consistent conversion rates, then the more traffic you drive the better off you will be. 1. You are not targeting the right traffic. 2. Your site is not optimized to convert the traffic that you are driving to it. Remember; visitors don’t ever fail to convert, it’s your site that often fails to convert visitors. Hi, Atle! Glad you enjoyed this blog post — this is a hot issue that’s gaining speed. Thanks for your comments, too. Do you want 1 million visitors where 1.000 buy, or do you want 100.000 visitors where 10.000 buy ? You don’t want 1 million visitors where *no-one* is interested in your product/service. This is the important part regarding SEO (attracting *many* of the *right* visitors). Then, when you get visitors that *potentially* might buy your product/service, conversion optimization will improve how many of these who *actually* “convert” ? Hey Chris, big fan of your work @ WF. So glad to see other companies driving home the importance of a well rounded marketing campaign. CRO and SEO complement each other in so many ways. Thanks for the comment and support, I’ll be happy to share my thoughts on your blog post! Hi, Chris, thanks so much for taking the time to read and give your insight — really appreciate it. 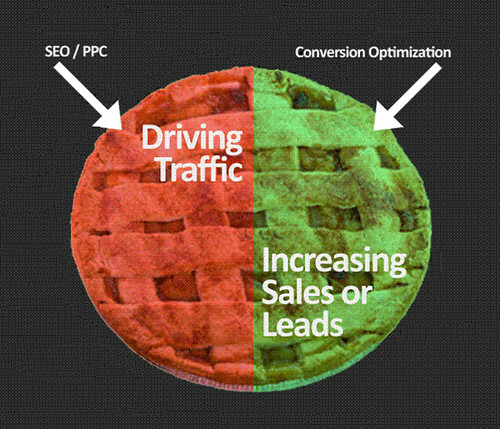 I totally agree that the relationship between SEO and conversion optimization is an important one. I’m glad to see you writing on Conversion Optimization, Jessica. It’s important for the SEO community to understand the relationship. Scott, your 3 reasons to test are good ones. More and more companies are testing and you’ve got to keep up with the knowledge they’re gaining. As Conversion Optimization experts, does it capture all the benefits of CRO for SEO? Hey great feedback. I’ve noticed the same thing about much of the SEO community. I think it’s great that people are so gung ho over driving traffic to their sites; that is the first step after all. But there are lots of other things you can do to support your SEO efforts. Thanks for your feedback; so glad you enjoyed the topic! But I can’t take credit for the expert insight that Scott provided for this piece — he really knows his stuff, and it was a pleasure learning about this often overlooked issue. After participating in forums about SEO, the most often question asked is how to perform better on search engines and page rank. The question about conversions is hardly asked. This is probably due to all the hype of SEO that they begin to forget why they are doing it in the first place. You’ve made great points on this topic. This article is a breath of fresh air. Great job on this Jessica. Thanks Mike! That’s a fantastic point. If you drive traffic at your site but your site doesn’t do it’s job, it’s hard to justify a ROI. I agree with you. Thank you for reading, Mike! The whole concept behind Search Engine Optimization is a return on investment. If your campaign isnt delivering on that, then why bother?? Conversion Optimization really is the best way forward, as it ensures that – in simple terms – your website turns visitors into customers. So thanks for the article Jessica.